Keep track of an infinite amount of bills. Every bill is stored locally on your phone and you can switch between bills easily. Participants can be added from the phonebook on the phone or entered manually. The app will automatically fetch the email and phone number of a contact for later use. When you're done using a bill simply delete it or clear the expenses in it if you want to reuse the participant setup. The bill overview screen is the heart of the app. 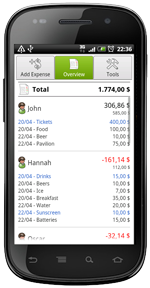 It shows a complete list of expenses for all participants including the sum and balance. The sum of expenses shows the total amount of money that the participant has laid out in the bill. The balance summarizes what the participant owes to the group (or what the group owes to the participant). A black positive number means that participants has laid out more than the rest of the group. A red negative number means that the participant owes money to the others. Click on a participant to add / edit expenses for this participant. Choose who paid for the expense, enter a name for the expense and how much it was. That's it, you've added an expense to the bill. 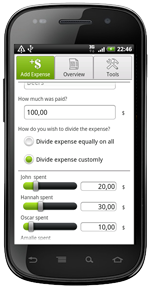 You can also choose to divide the expense customly. Use this option if the participants have spent different amounts in the expense. This could f.x. be a restaurant bill. It is not fair that the guy who ordered a soup should pay the same as the other guy who had a lobster. This page provides you with several options. You can let Bill Buddy calculate how the bill should be settled the easiest way possible or you can send information about the bill over email or sms to other participants. There is also a set of basic tools that lets you edit the bill name and currency and lets you add, edit or remove participants. Removing a participant from the Bill (maybe somebody desides to leave the travel group or can't make it to the party you're planning) is not as simple as it sounds! How should the expenses and spendings which already exists in the bill be handled? Bill Buddy lets you choose to either settle this by letting the participant pay his part to another participant or to divide his spendings and expenses amongst the others. Bill Buddy can show you how to settle the bill. Click 'Settle' and Bill Buddy describes who should pay what to who. These details can also be included if you send the bill by email or sms. If you have any question don't hesitate to contact me and I'll be happy to help you out. You can find contact info under 'Feedback'.